just up the pike: what's up the pike: under the bridge downtown . . .
what's up the pike: under the bridge downtown . . .
- TBD reports that support is growing for a $750,000 pedestrian bridge connecting the future Silver Spring Library at Wayne and Fenton to the parking garage across the street. While I've heard compelling arguments for the bridge - namely that the intersection of Wayne Avenue, Fenton Street and the future Purple Line will be a super hassle for pedestrians to cross - I strongly feel that the answer is to fix the intersection and make it more amenable to all walkers, not bypass it with a bridge solely for those going to the library. Here's hoping this idea stays on the drawing board. We've got better things to do with that money. - Perhaps you do catch more flies with honey than vinegar, because Sk8ter Mom is back with a thoughtful and reasoned explanation of the need for a skatepark in downtown Silver Spring. If the comments following the Kojo in Your Community show last week were any indication, people weren't too happy about her appearance (with many young local skaters in tow) at the meeting. Hopefully, Sk8ter Mom's latest attempt to make her case can be more persuasive. - Historian 4 Hire David Rotenstein looks back at his past work in journalism and writing about folk music in the Deep South. - Prince of Petworth visits the new-ish Silver Spring Civic Building, and by "visit" we mean "looked at some photos of Flickr," because we know everything that's not in the District is tragically lame and not worth paying any real attention to. - Congratulations to Karen Montgomery, your new District 14 State Senator. After years of serving us as a delegate, we know that many good years lie ahead for East County. You nailed it. We need to fix the intersection ASAP. I don't know why there are so many debates about this pedestrian bridge and so few about fixing the intersection. A pedestrian bridge does nothing to help the people who actually live in the DTSS area or who come to the area via public transportation. How is it access for all, if the only proposal being thrown around is a way to make it easier for people who drive to DTSS to cross a street, while ignoring everyone else's needs? In fact, this pedestrian bridge would make the street level situation even worse by encouraging people to use the bridge and allowing drivers to think the street is theirs and theirs alone. If the intersection were fixed and made easy to cross for all, we would have access for all. Every intersection Silver Spring should be easy to cross and safe. Fix that. P.S. I also agree that it is nice to see sk8termom right something so thoughtful on skateboarding. That's the discourse we need on that issue. "I strongly feel that the answer is to fix the intersection and make it more amenable to all walkers, not bypass it with a bridge solely for those going to the library." DTSS has gone through several life stages over the years. The roads and crosswalks are a mishmash of old layouts, a bit of new layout, and some quick fixes to match the two. I hope they take the time to actually redo some of these intersections so that they are safer and more efficient with current levels and types of uses. Indeed the Fenton/Wayne intersection needs to be fixed. And it will be fixed. The intersection project will proceed completely independently of the library bridge to the parking garage. Building the bridge isn't an either/or situation... it is a chance for a win/win for both pedestrians and the handicapped community, as well as for everyone else who will need to drive to visit the new library or Fenton Village. 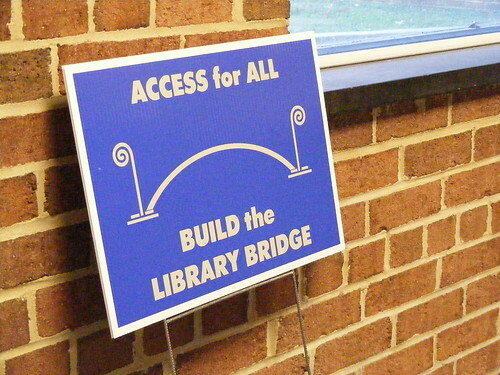 We need to build the library bridge. It is the least costly and best way to provide handicapped parking for the new library!